Bringing up Salamanders: "The Annual Black Cat Panic"
Even if this indivual had some archaic view of witches, he should have realised that the black cat is the last creature in danger. These scares, of one kind or another, are always cropping up. I don't suppose we'll ever overcome this kind of ignorance. Hi, I live in West Texas! I wonder if it was one of our area rescue operations that made the remark. Truly, you may not realize it, but there are a lot of people out here who SAY they are witches or warlocks, and then hurt the animals, most especially the black cats. They are just SAYING they are of your faith, obviously they are not, and yet it makes people afraid of pagan persons. It is very unfortunate and I wish the rescue people would not further the confusion by their remarks, because cruelty is all over and there's no need to try to pin it on your religion. Where I work, at the school for what we call juvenile offenders, they all declare they are Christians but they also brag on hurting animals, so the rescue operations need to be careful and point out that many will say anything but it doesn't make it true. Sorry for the long comment, while I have a different belief system than yours, I would never go around spreading falsehoods about your beliefs. I rescue cats all the time and I have yet to have to do a rescue from any pagans! I wish people would educate themselves about different religions!!! All I care about is, Is a person kind-hearted? Hugs to you. Now I'm off to see the little kitty keyring you made!!! It's horrible that these views of Pagans are still so alive today. Animal cruelty is one thing that really hurts me deeply. I have had personal experiences with people who harm animals, and I can't look at them the same. I work with Black Cat Rescue (http://www.blackcatrescue.com) in Boston, MA (USA). I found your post while searching for information about black cat adoption rates. Black Cat Rescue is a no-kill, all-volunteer network of foster homes dedicated to saving the lives of homeless black cats and kittens by providing them with quality foster care while actively seeking loving, permanent adoptive homes. We are currently seeking new foster homes in the Boston area and thought you might be able to help. 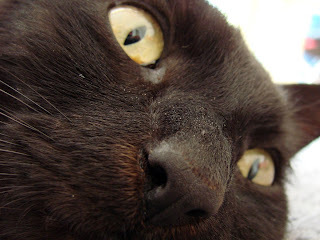 Black cats experience lower adoption rates, particularly within kill-shelter environments. For this reason, we're dedicated to assisting individuals and other organizations with the care and adoption of black cats. Fostering has a significant impact on saving the lives of animals. The fostering process involves completion of the application to setup a foster profile and one home visit before placing a cat or kitten and we work at the foster home's pace. Please contact blackcatrescue@gmail.com if you are interested in learning more about becoming a foster home or if you have any questions. A no kill shelter in Oregon is having a Black Cat Adopt-A-Thon on Halloween Night. I've posted a notice about this at The Witches' Voice.